Apple AirPods (2019) review | What Hi-Fi? It’s easy to think of Apple as a company that doesn’t make mistakes, but almost as easy to show that it does. There was the iPhone that wouldn’t make calls if you held it a certain way, Apple Music’s pre-installed U2 album, Apple Maps and the kitchen-top damage caused by the (otherwise excellent) HomePod. But while it might not be flawlessly Midas-like, most of what Apple touches does eventually turn to gold, and the Apple AirPods are no exception. When first introduced, they looked daft and didn’t sound great, but drawn in by their magical design and bleeding edge technology (not to mention brand affinity), enough people bought them to make them a common sight in towns and cities worldwide. So, while it’s surprising that Apple hasn’t seen fit to (publicly) address any of the criticisms aimed at the original AirPods, many have already been won over by their magic. This second-generation model is much more about sprinkling a little more pixie dust over proceedings than pushing the AirPods into hi-fi territory. But here’s the kicker: without any huge fanfare (and perhaps even without even intending to), Apple has improved the AirPods’ sound quality. Switch between the old and new AirPods and the first difference you notice is that the new pair goes louder. That might not sound like a big deal, but it is confirmation that the sound has changed. Extra loudness is generally welcome, too, as the AirPods isolate little in the way of outside noise so often need to be played louder than earphones that fill the entrance to the ear canal. Apple has always gone for a natural, fairly neutral sonic balance across all of its products, and it’s no different with the new AirPods. There’s no artificial boosting of bass or enhancement of treble. You feel as though you’re listening to music with little to no manipulation, and that’s something for which we’re always hugely appreciative. But the new AirPods add a degree of subtlety and sophistication that their predecessors lack. Low-level dynamic shifts are more granular and delicate, while bigger contrasts between quiet and loud are more pronounced and dramatic. There’s more detail to the delivery, too, and the presentation is a little more open and spacious. Organisation, meanwhile, is subtly improved thanks to better timing. Each of the above improvements is fairly subtle in isolation, but combined, they create a noticeably more exciting and engaging performance. The old AirPods sound a bit dull and lifeless by comparison. However, these AirPods are still some way short of being perfect. While cleaner and more organisationally adept than the preceding pair, they still veer towards harshness at high volumes and struggle to make sense of the most built-up sections of some tracks. The old AirPods were far from being the benchmark in terms of audio quality – the most sonically capable true wireless in-ears, the Sony WF-1000Xs, are noticeably more detailed and rhythmic. But no rival comes close to matching the AirPods from a technical point of view. There was so much right with the first version, that simply doing the same again is enough to beat many rivals. In our experience, the connection is essentially flawless with no dropout, either between phone and headphones or the two buds. Initial pairing and switching connections is effortless; the case charges the earphones quickly; battery life is excellent (five hours of listening with around another 19 available via the charging case); and they’re almost impossibly small and light. Under the skin there’s a new chip, with the W1 of the original AirPods having been replaced by the H1, which allows faster pairing and switching between Apple devices, lower latency (good for gaming), better battery management for more talk time (but unchanged general battery longevity), and entirely hands-free voice control. The only problem is that you might not notice these improvements, as they weren’t weaknesses of the old AirPods. A wireless charging case is also now available, either in a £199 bundle with the new AirPods (a £40 premium over the standard charging case) or as a separate, £79 purchase – useful for owners of the old AirPods who want to upgrade their charging experience. This new case works with all Qi-compatible charging mats and has the battery level-indicating LED on the front for easier reference. 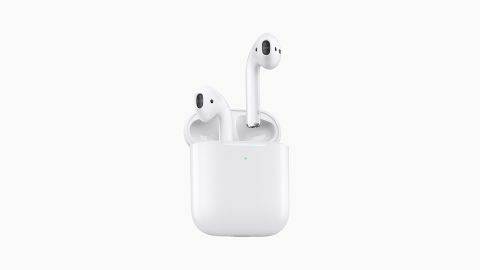 Though the AirPods have been improved in areas where they already excelled, Apple has chosen not to address some of the criticisms levelled at the original model, including the fit. While the one-size-fits-all approach is laudable, for every person for whom the AirPods fit snugly enough for a run or a cycle, there’s another who can’t get them to stay in during the lightest of movements. The lack of physical buttons can be a pain, too. Siri and two user-specified double-tap controls have proved inadequate replacements, particularly for those using the headphones while exercising. Some will also continue to baulk at the design, which draws the eye in much the same way as a pair of earrings. However, the ubiquity of the original AirPods has made them largely invisible and wearing a pair no longer seems to attract the same kind of attention. Perhaps for some people, that will itself be an issue. Apple has strengthened the AirPods in the areas they were already strong and chosen to leave their weaknesses more or less as they are. It’s an odd approach, but the success of the first-generation model proves that the formula works. We’d love them to fit more people better and to have some physical controls, but Apple is sticking to its guns. Besides, sound quality has improved, and that’s more than we were expecting.